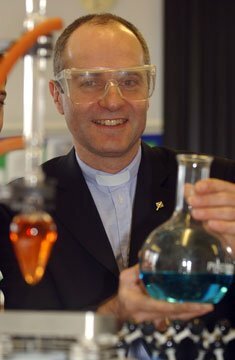 A genetic scientist and self-proclaimed 'fitness fanatic' is the current Bishop of Swindon. The Reverend Dr Lee Rayfield was approved by HM The Queen and took up his duties in summer 2004 aged 49. He replaced the Right Reverend Michael Doe, following his move to becoming Director of the USPG. With a PhD in immunology, Dr Rayfield has written more than 30 scientific papers and articles for scientific journals and continues to sit on the UK Gene Therapy Advisory Committee which advises the government on clinical research in the field of gene therapy. He is also a member of the Society of Ordained Scientists, a group of people who seek to connect the Church with the worlds of science and technology. "I am concerned about the growing gap between inherited forms of church and our contemporary culture," he said at a specially arranged event at Ridgeway School, where his appointment was formally announced. "I want to help people of all ages, backgrounds and temperaments to find a living faith in Christ and to build churches which encourage this. "With my scientific hat on I am especially interested in discussing the specific issues related to genetics, trying to bring insights from Christian theology and ethics to bear on them." Apart from his great interest in evangelism and in science, the Revd Dr Lee Rayfield also desribes himself 'a bit of a fitness fanatic'. his wife Liz and daughter. With two of his children he is a member of an athletics club and competes in track competitions over 200m to 1500m. He also runs in cross-country competitions, as well as playing tennis, football and occasional rounds of golf and with his wife. Revd Lee also likes nothing more than watching rugby union. Outside of sport, the bishop's other interests include watching films and the making of cider. Formerly Vicar of St Peter with St Mark's parish of Furze Platt, Chaplain of St Mark's Hospital, Maidenhead and Area Dean of Maidenhead and Windsor, Dr Rayfield took up his position as second Bishop of Swindon following his consecretion by the Archbishop of Canterbury on Wednesday, 8 June 2004.